SPECTACULAR BEACHFRONT HOUSE AT SAPPHIRE BEACH. 4BEDROOMS/3 BATHROOMS AND RUMPUS WITH SOFA BED, SLEEPS 10. MODERN TRILEVEL HOME WITH MASSIVE ENTERTAINING DECK AND POOL OVERLOOKING OCEAN. 100M STROLL TO BEACH DOWN STAIRS LEADING OFF FRONT GARDEN THROUGH LITTORAL RAINFOREST PATH. TOP FLOOR - MASTER BEDROOM, ENSUITE, RUMPUS ROOM AND ENTERTAINING DECK. MIDDLE LEVEL - FRONT DOOR ENTRY TO STUNNING MODERN KITCHEN WITH GRANITE BENCHES AND OCEAN VIEWS TO DIE FOR, BEDROOM,BATHROOM,LOUNGE AND DINING, STUDY, OUTDOOR DINING AREA, AND POOL. BOTTOM FLOOR- GROUND ACCESS TO GARDEN,TWO BEDROOMS,BATHROOM AND LAUNDRY. MAGNIFICENT OCEAN VIEWS FROM ALMOST EVERY ROOM. D.L.U.G AND BEAUTIFULLY LANDSCAPED GARDENS WITH LARGE GRASSY AREA FOR OUTDOOR ENJOYMENT. WALK DOWN BEACH TO NEARBY RESORTS AND RESTAURANTS AND CONVENIENCE STORE 2 MINUTE WALK AWAY FOR DAILY SUPPLIES. SIT BACK AND WATCH THE WHALES GO BY OR ENJOY A SPECTACULAR VIEW OF THE FESTIVAL OF SAIL YACHT RACES HELD IN THE FIRST WEEK OF JANUARY. A TRULY MEMORABLE EXPERIENCE AND A WONDERFUL PLACE TO STAY FROM WHICH TO ENJOY ALL THE COFFS COAST HAS TO OFFER. Fiona was lovely to deal with and ensured we were looked after. The property was great with pool and BBQ facilities, extremely spacious and within minutes walk to the beach. We thoroughly enjoyed everything about out stay at Warrawee House. Stunning views, refreshing sea breeze and plenty of room for our 2 busy families. So many choices of spaces to gather and enjoy. Fabulous pool area, amazing alfresco balcony, relaxing lounge areas. Generous size bedrooms with the master being a real treat. Bathrooms on every floor. Lovely hosts with easy communication who are very generous providing everything you need throughout the kitchen, bedrooms and bathrooms. Short stroll to beautiful Sapphire Beach. Breath taking grounds and gardens. A little slice of paradise, we will be back again. We thoroughly enjoyed our stay in this wonderful home away from home. It had everything our family required and more. On entering the property we noticed whales in the ocean out of the kitchen window. The views were even more spectacular from the top entertaining deck. The master bedroom is in the top floor and we woke up to birdsong from the multitude of beautiful bird life, and wonderful ocean views and the sound of waves. Beautifully decorated with some eclectic and interesting pieces from around the world, there was always something new and interesting to look at. I would highly recommend a stay at this amazing property at Sapphire Beach. Everything about this house is as described and better. Fabulous location. This amazing house managed to absorb three families (including 6 children) for a 10 day trip over the Christmas and New Year period. 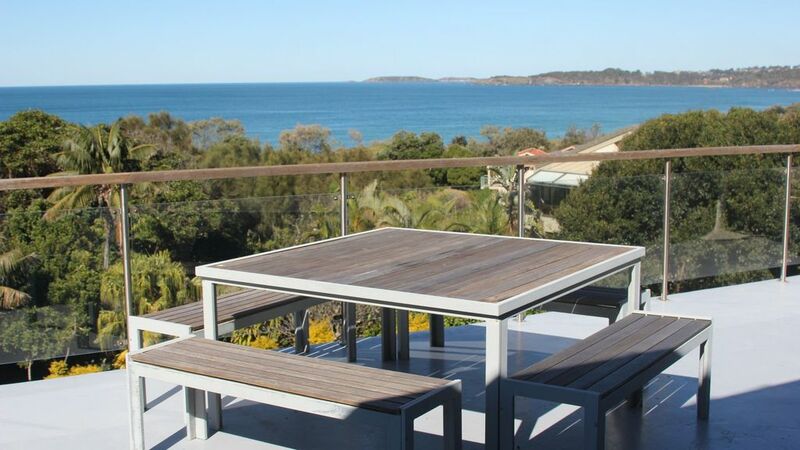 We highly recommend it to anyone considering a Coffs Harbour getaway! We'll miss the amazing swimming pool, the deck with it's stunning veiws, the space, the short walk to the beach and waking to the sound of the waves crashing on the shore! There is truly nothing we can complain about and would even consider visiting warrawee house annually! Looking forward to our next stay!